trek to the sea. It was so cold that they were moving extra slow. Some flipped on their backs. But what an amazing privilege to witness. 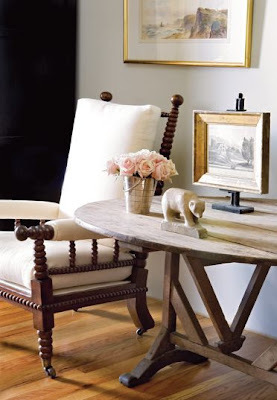 The Picture above and those below for that matter...come from Phoebe Howard, a designer who, along with her architect husband, have opened several stores in Jacksonville and Atlanta. The following three pics are taken inside her store Max& Co. I don't think they would notice...do you? 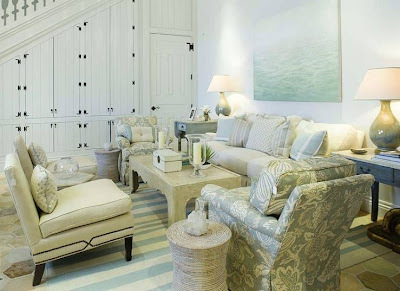 Check out a bevy of more gorgeous pics here! That bathroom, so different from my style, yet I'm loving it. 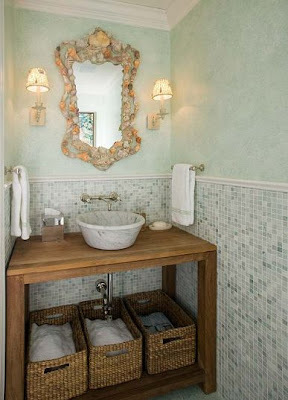 The seashell mirror so works for that space too. First, I hope the little turtles made it to the sea! That must have been so neat to see that. 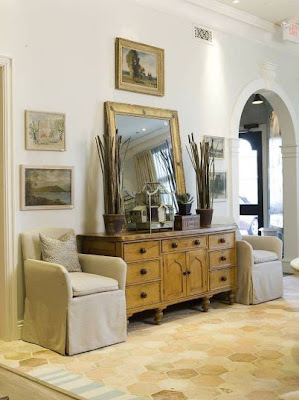 Second, I WANT that shell mirror..but NEED a place to put it! Thirdly, I WISH my house felt like her store! 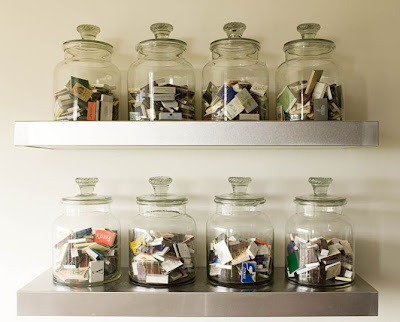 I love the look and feel of those images...Sigh....As always, fun post Linda! ... BTW, what temperature is "cold" in the morning there???? This morning it was 20 degrees here! LOL! ooooohhh! thats one miracle i've not seen! how cute. 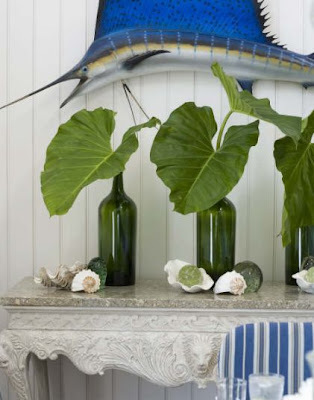 love the glass on dark cabinet..
and the wine bottles w/ tropicals and shells...i might try that one! The rest of the pictures - wow. I would happily move into any of those rooms right now! What cute little turtles! I can imagine what an amazing miracle to witness. 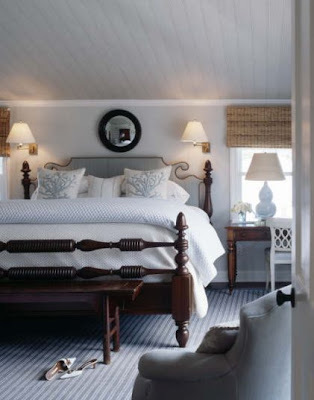 I just love that large bed. Looking so beautiful and surely lovely to sleep in. OMG, I'm practically orgasmic! If you hear moaning from out West, it's just me enjoying this decor pleasure! 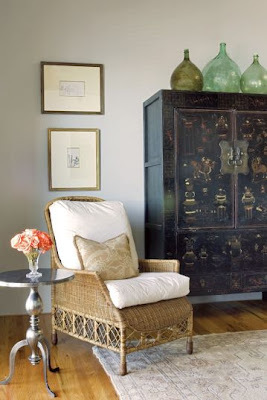 Holy cow, I love her work...especially that Asian cab w/ the glass bottles. And the fish. Damn...perfection! 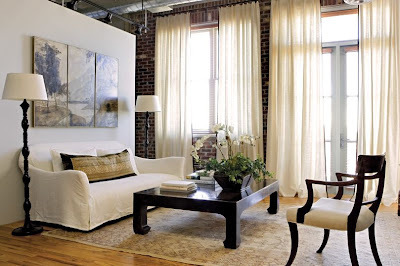 The picture of the room with the tall windows and brick wall is amazing! If you're looking for a roommate, I'll be happy to move into that store with you! I think we'd add to the ambience don't you? What a sweet and lovely description of this morning's event. The turtles are cute and I love the kitchen Oh what a great party place!! 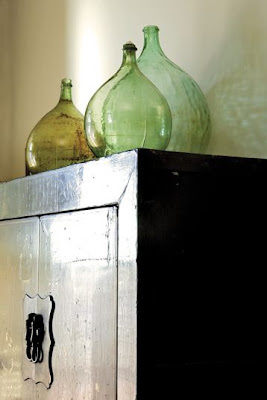 Why am I such a sucker for colored bottles and vases? They look so nice. 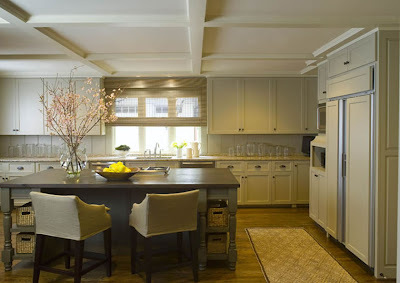 I heart the kitchen...so spacious. oh these pictures are just gorgeous. Thanks for sharing them....some great inspiration! 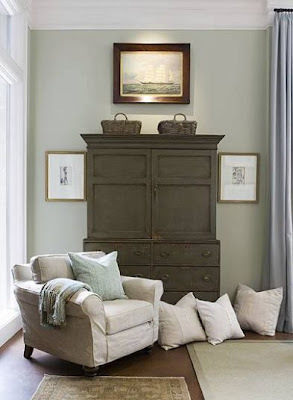 THIS is exactly the "feel" I'm going for in my home. Nope, not on the beach or even close, but the FEEL is so peaceful, calming, and timelessly simple that I know I could live with it forever. I adore all the photos, so thank you for sharing. How precious are those turtles!? Someday I will walk on the beach. Do you think they could make room for me too? Gorgeous Linda, simply GORGEOUS! The turtles took me back in time when I lived less than a mile from the beach. I still remember those late midnight walks on the beach with my brothers and friends as we went turtle hunting. Of course not to kill them but to watch the huge mama turtles come in to lay her eggs. And I also remember watching many baby turtles make their way back to sea after hatching. I was always fascinated with that cycle. Thank you for the “BEAUTIFUL” reminder. I think my blood pressure just went down ten points! Gorgeous stuff! I'm going to bookmark the site AND this post, I think!! No...we didn't help the little guys...but promptly called a local biologist who is in charge of the turtles...He told us it is best to leave them. Happily on our trek today, we saw many many little tracks to the deep turqoise ocean. These were Green Se turtles that are more rare than the loggerhead...and because it is quite lte in the season, the biologist knew of and had been watching this nest. Ivy...cold was in the low 40's...and with barefeet, that is a bit chilly for us thin blooded floridians! Thanks for all of your GREAT comments. You all make it sooo fun to post! Baby turtles, and Phoebe Howard! Now that's my kind of post!! Thanks! Oh my goodness, those pictures are amazing, thanks for sharing, I absolutely LOVE the beach vibe!!! Is it cool in your neck of the woods? It is downright cold here in Texas! hey - i'm already living there - just push my things off to the side and come on - we'll have a blast! oh to see little sea turtles running out to sea! 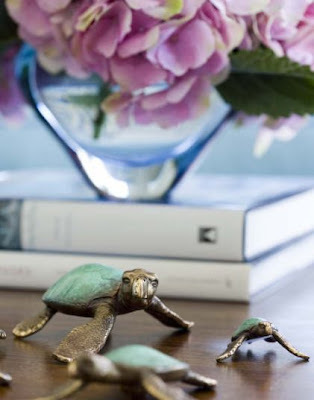 I have a favorite, tiny, little bronze...of a sea turtle. How cool on the turtles!!!! I would love to see them. Did you flip the ones on their backs over? Thanks for telling us about Phoebe Howard. I spent at least an hour looking through her website. Love her work! 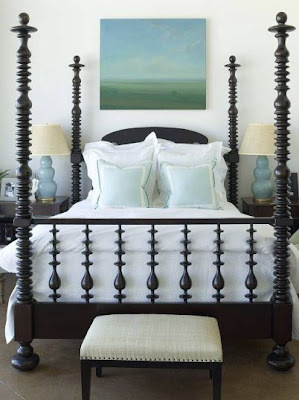 I really like that bad, I have had an arts & crafts bed frame for TOO long, that would be perfect, so would living in that house!!! I love allll of these images! thanks! 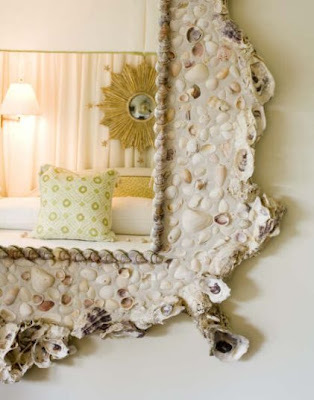 These rooms are lovely -- adore the seashell mirrors. I would love to wash my hands in that bath room ACKKKKKKKKKKKKKKKK!! !